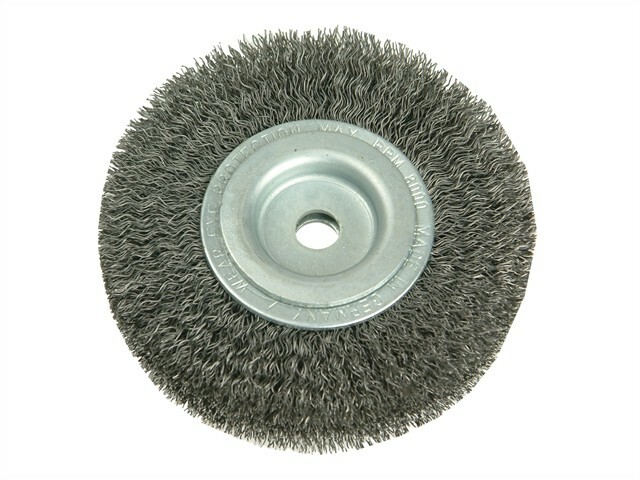 The Lessmann Wheel Brushes are filled with crimped wire and are used for obtaining different surface finishes. For the removal of rust, paint and dirt, for roughening, de-burring. Stripping or polishing. A decisive factor for choosing the most suitable brush is the wire and tube diameter. Brushes with a larger tube diameter are filled with more wire, are more aggressive and have a longer life. Some of the brushes are supplied with adaptor sets that allow easy mounting on all popular grinding machines. Set 1: 30, 22.2, 20, 16 & 12mm, 1in & 1/2in. Set 2: 40, 32, 22.2, 20, & 16mm, 1in & 1/2in. Set 3: 50, 32, 22.2, 20, & 16mm, 1in & 1/2in. Set 4: Brushes With Metal Discs Bore 50.8 & Double Keyway 7x13; Plus Adaptor to Bore 30.